One of the places that I have always wanted to visit is Hawaii. I’ve visited beaches from California to Florida and Mexico, and each of them I have found uniquely different from the other. I’d love to walk on the black volcanic sand and see the green cloaked mountains rising sharply from the sea, eat some local food, and enjoy the island life…if only for a short while. Someday I will make it to Hawaii. But in the meantime, images of its beaches and sunsets have been the subject of a lot of my art. I’d love to climb into this scene and drift in the breeze in that hammock! This piece was painted for a friend and brings the scenery of Hawaii to a Colorado home. 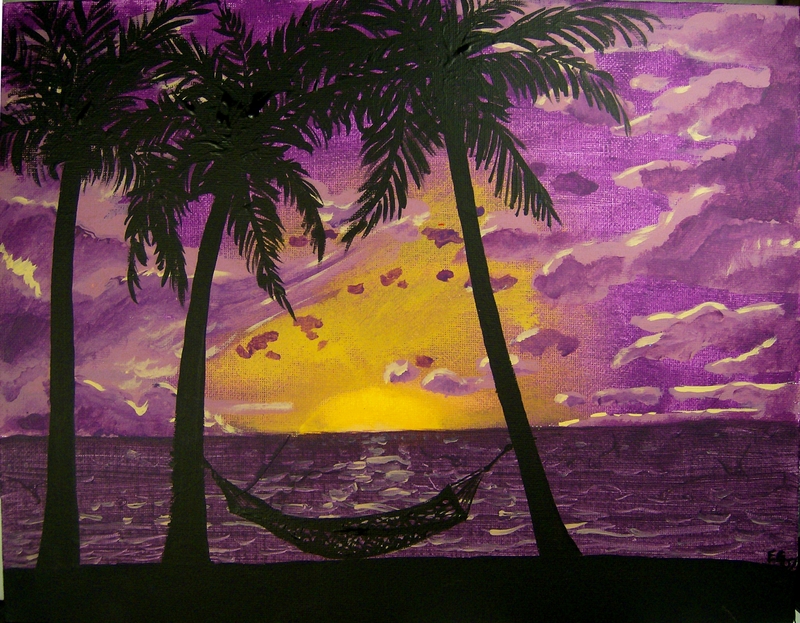 This entry was posted in acrylic, beach, hammock, hawaii, island, landscape, nature, ocean, outdoors, painting, palm, purple, sea, sky, sunset, tropical, Uncategorized and tagged acrylic, art, beach, hammock, hawaii, island, landscape, nature, ocean, outdoors, palms, purple, sea, sky, sunset, tropical on June 2, 2013 by Jumping Jack Studios.